Habitat destruction; inadequate, or NO shelter; depleting clean water supplies, or NO water; illiteracy; starvation, undernourishment; inadequate, or no health care; HIV/AIDS, malaria and other disease epidemics; poor energy efficiency, or insufficient fuel supplies; lack of renewable energy sources; national debts; population growth; soil erosion; deforestation; ozone depletion; acid rain; Global Warming/climate change; military spending and the war racket, refugee problems; weapons proliferation; government corruption; exponential growth economy; excessive energy consumption; capitalism; socialism; profit; uneven wealth distribution; economic euphoria; money fetishism; money lending; accumulation of toxic pollution in the environment; civil conflict; collapse of fisheries/fish species; collapse of natural pest regulation systems; deforestation; desertification; soil degradation; salination, soil erosion, loss of topsoil; loss of soil fertility; droughts; globalization; economic collapse; ignorance; epidemics of plant and animal diseases; extreme climatic events; extreme rain events, floods; failing ecosystems; famine; foodborne, waterborne, airborne and insectborne infectious diseases (viral, bacterial, parasitic, fungal, prion); fuel shortage; global collapse of pollinators; human-enhanced natural catastrophes (earthquakes, floods, tsunamis, hurricanes, tropical storms, cyclones, extreme rainfall events, landslides, volcanic eruptions, droughts and wildfires . . .; human-induced climate change; increased UV radiation; industrial accidents (radionuclide, chemical and oil spills); inordinate prevalence of psychopathology; industrialism; atomistic individualism; consumerism; throwaway culture; dysfunctional societies . . .; land use change; hunger; neurological disorder caused by mass suicide from mercury and other heavy metal poisoning; moral decline; unethical behavior; unsustainable lifestyles; overconsumption; material possessions; overshoot of carrying capacity; increased ecological footprint; overpopulation (esp. 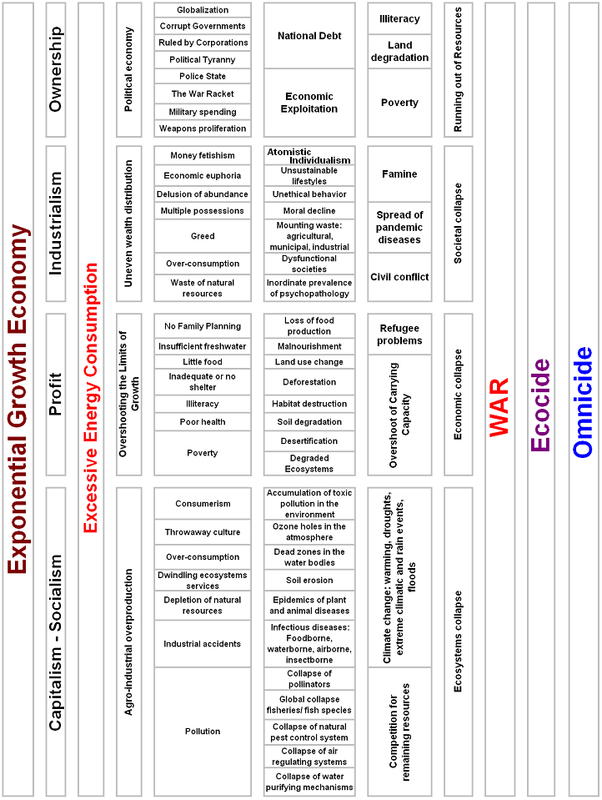 in developed countries); mounting waste: agricultural, municipal (garbage and sewage) and industrial; overshooting the limits to growth; poor global harvest; food scarcity; poverty; running out of freshwater; running out of land; cities sinking into the ground; societal collapse; spread of pandemic diseases; tourism [euphemistically, eco-tourism;] war (conventional and nuclear) . . . ecocide; omnicide.